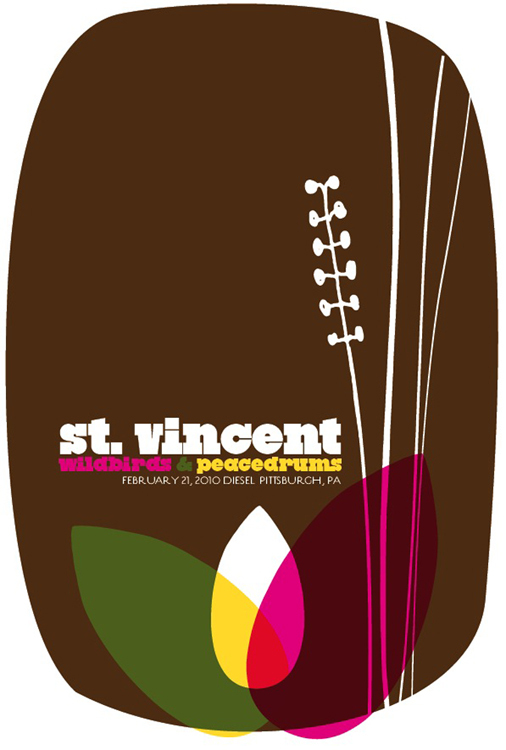 St. Vincent w/ Wildbirds & Peacedrums, limited edition silkscreen poster. Hand screen printed poster for St. Vincent’s show on Sunday, February 21, 2010 at Diesel in Pittsburgh, PA. Beautifully simple and surprisingly complex all at once, that’s St. Vincent’s music. Super lovely and I’m pleased as punch to be a part of the Winter 2010 tour poster series for her. 6-color all hand pulled screenprinted poster with bark brown, clear yellow & magenta hand-mixed, non-toxic water based acrylic inks. Super secret magic: Three inks were used to make 6 colors with lots of overprints. (Overprints are when semi-transparent layers of ink combine and overlap to make another color.) I will have a very imited number of this poster for sale, as most of the edition was sold by the band on the night of the show & on tour. Size: 16w x 22h inches. Edition of 125. Paper: archival Cougar 100 lb White, cover weight. Visit our Shop here to purchase.